Firaaq is an Urdu word that means both separation and quest. Set in the aftermath of a communal carnage. Firaaq is a work of fiction based on a thousand true stories. It is an ensemble film that takes place over a 24 hour period a month after the worst of the violence is over. Firaaq explores their relationships as they experience many fierce and delicate emotions of fear and prejudice guilt and revenge trust and betrayal and a loss of innocence that wounds the soul forever. Violence truly spares nobody yet in the midst of all this madness some still sing hopeful songs for batter times. Firaaq succeeds because it allows the humanity of its characters to shine through the darkness and because of the skill with which the many narrative strands are interwoven. It’s a remarkably assured directorial debut by one of India’s finest actresses Salman Rushdie. 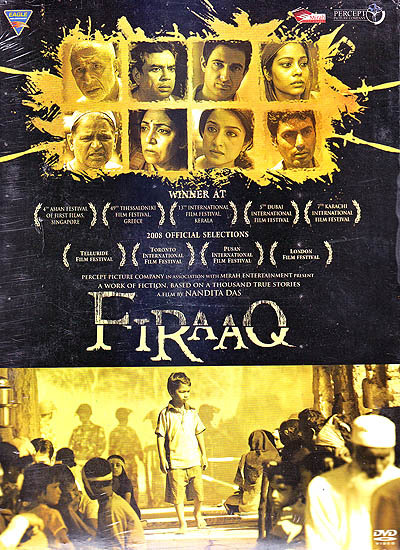 Firaaq isn’t just another well intentioned film. There are many compelling reasons for anyone to see Nandita Das haunting directorial debut. It is a very evocative eloquent, poignant narrative with a seamlessly excellent cast. Deepak Chopra. Firaaq is revelation placing Nandita among the front rank young directors of today. It is subtle understated yet packed with emotional intensity that is nothing short of volcanic. A highly accomplished film. Shyma Benegal.